Home / Unlabelled / Chelsea Player Mocks Opponent During Match For Being Short. Chelsea Player Mocks Opponent During Match For Being Short. Chelsea star Matt Miazga mocked Mexico’s Diego Lainez for being short. 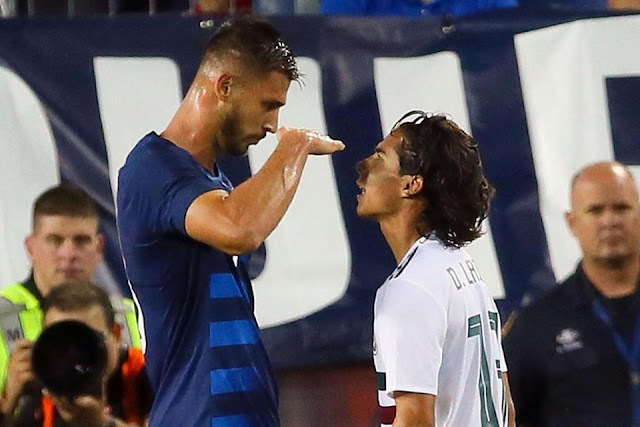 Miazga, who stands 6ft 4ins, did not exactly see eye-to-eye with his 5ft 6ins opponent during the friendly clash between the United States and Mexico last night. Miazga then peered over the top, mocking Lainez for being vertically challenged. The USA star said afterwards: “We talked a little smack. It’s part of the game. It’s mental warfare. Lainez denied being affected by Miazga’s trolling. Caretaker coach Dave Sarachan saw his US side win 1-0 thanks to Tyler Adams’ 71st-minute goal – his first for his country.